The biggest lottery jackpots of all time belong to the United States multi-state lottos Mega Millions and Powerball. For many years the Mega Millions $656 million jackpot held the record, however rule changes to both the Powerball and Mega Millions formats in 2015 and 2017 resulted in the first billion dollar jackpots in 2016 and 2018. Because Mega Millions and Powerball are reduced by federal and state taxes the advertised jackpot can be somewhat misleading. The actual amount of the payout is therefore listed in brackets. Traditionally, if you play a national lottery in a given country, then you must be a resident in that country. However, at Lottoland, you can bet on international lotteries regardless of where you live. 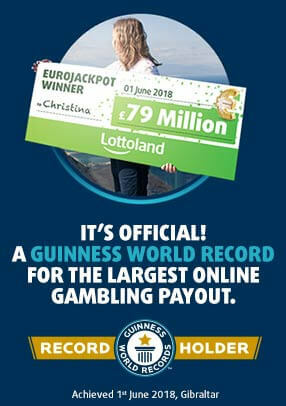 This is because Lottoland has a unique business model that allows you to bet on the outcome of lotteries from all around the world. What’s more, to guarantee your winnings, at Lottoland we are secured by the world’s leading insurers, ensuring that all your winnings are guaranteed to be paid in full as if you had won the official jackpot. *Jackpot values are approximate value based on time/date of conversion from USD/GBP. **We accounted for the net jackpot, the sum an individual winner received after tax, or would have received. Lottery winnings are taxable in the U.S., in contrast to Germany and most European countries. For U.S. lotteries we therefore take taxes into account in order to have a fair comparison of actual winnings. Typically, lottery winnings in the U.S. are taxed at an average rate of 25-40%. We used a value of 38%. Note: It is common for U.S. lotteries to pay out lottery jackpots as annuity ("Annuity Option") over several years (e.g. winnings of Mega Millions will be paid out over 30 years).